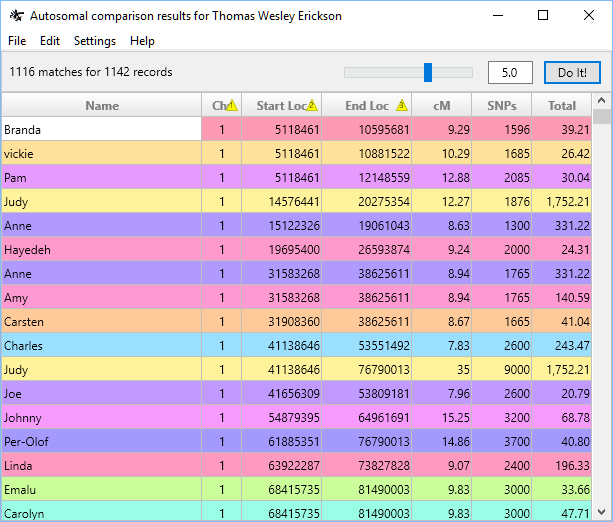 Most DNA genealogy enthusiasts are familiar with chromsome browsers like the ones offered on the FTDNA or 23AndMe web sites. The data file will be downloaded into your Downloads folder; FTDNA files are named "nnnnn_Chromosome_Browser.csv" where "nnnnn" is the kit number. 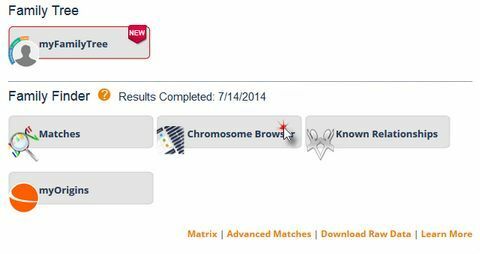 23AndMe files are named "nnnnn_chromosome_browser_results.dat" where "nnnnn" is the Kit Number. Open the data file - although you can use the File | Open menu option, ADNA provides a context-sensitive Do It! button which tries to determine the necessary action based on program state. If no file is open when the Do It! button is clicked, the File | Open dialog will be displayed. Select a data file from the Downloads directory and click on the Open button; the data file will load into the grid. If the format is not compatible with ADNA, an error message will be displayed. The default segment threshold is 5 centiMorgans; the user may set this to any reasonable value (including fractional values). If a data file has already been loaded when the threshold setting is changed, the user will be prompted to reload the data file, since it may have been modified. 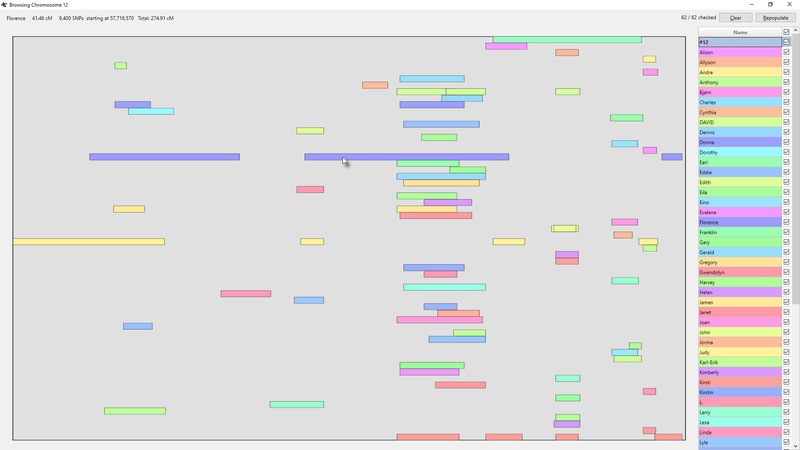 To display all overlaps sorted by chromosome and location, select Settings | Output by Chromosome and click on the Do It! button. To display all overlaps sorted by name, select Settings | Output by Name and click on the Do It! button. To display segments in a browser, select Settings | Output to Browser and click on the Do It! button. 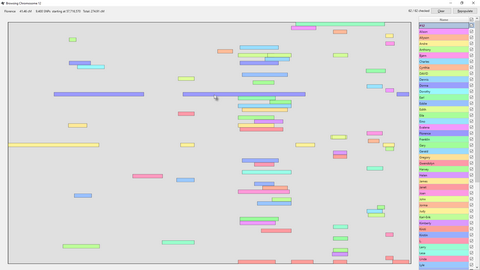 To "zoom in" to a single chromosome to view all segments, double-click on a choromsome in the browser. The chromosome browser and single-chromosome view each offer a pick list of names with segments that appear in that view as well as a count of segments; when the chromosome browser is displayed, only the first 25 records are selected. The user may use the check boxes in the pick list to select none, all, or specific names to display. Due to space constraints, the practical upper limit of selected records is around five to ten; if more than 25 are selected, they will not display in the browser. In all cases, the number of segments that match the user's current criteria (threshold and selected records) appears in each rectangle. When viewing segments in single-chromosome ("zoomed in") mode, loiter the mouse pointer over a segment to see the name, size of the segment in centiMorgans, and number of SNPs. Due to scaling and mapping limitations, the single-chromosome view is limited to 418 segments. If your current settings yield more than 418 segments (i.e. 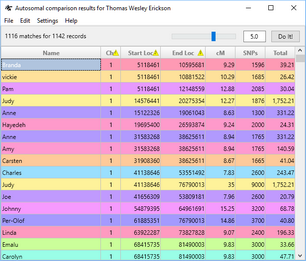 low threshold and many records selected), only the first 418 segments will be displayed. Use the checkboxes to select a different subset (while remaining under the 418-segment limit). There are many advanced techniques and features available to the sophisticated user; please refer to the User Manual for details.